The TECHT Hush Bolt is designed to improve the overall efficiency, sound signature and smoothness of operation in the Empire Sniper Pump Marker. 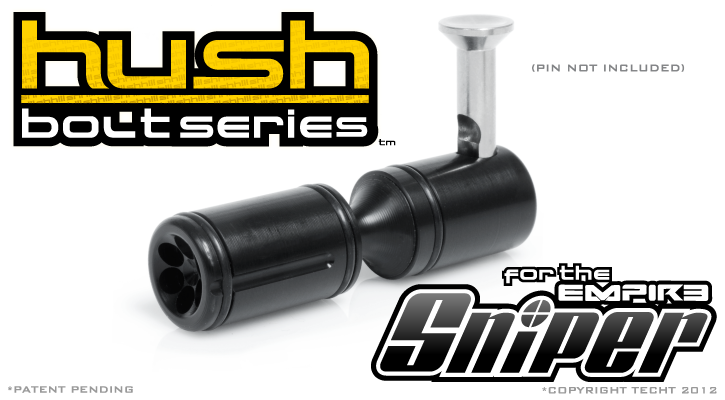 TECHT's Hush BoltSeries for the Empire Sniper Pump Marker utilizes our "Even-Flow" venturi face technology. This "Even-Flow" venture face along with our Sweeping Air Diversion Ramp allows the Hush Bolt to obtain optimal efficiency, while quieting the sound signature of the marker significantly. The Hush Bolt achieves better efficiency by capturing and utilizing air that is otherwise wasted. The two rear most o-rings capture all of the air released and forces it through the bolt to fire the ball, and the front o-ring seals in the breach to ensure that the air cannot escape anywhere except down the barrel propelling the ball. The Hush Bolt also features continuous cuts through to the face of the bolt to ensure less friction when making contact with the ball detents. So what makes the Hush Bolt for the Sniper different from Stock? Our Hush Bolt for the Sniper Pump has been fitted so as to produce less drag on the o-rings but still keep a good seal to maximize efficiency. This means a smoother pump without having to sacrifice any efficiency. The hush style face and o-ring placement also aids in knocking down the sound signature of the marker. Get a TECHT Hush Bolt for your Empire Sniper Pump and have one of the nastiest pumps on the field! Upgraded Sniper Hush Bolt. Works with Empire Sniper Pump Marker. Quieter. More Efficient.